Roseau, Dominica – May 8, 2009…….. At a ceremony to mark Europe Day in Dominica on Thursday, Prime Minister, Hon. 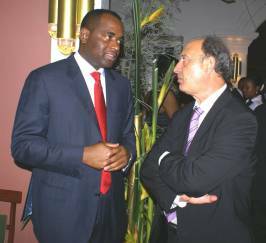 Roosevelt Skerrit acknowledged the contribution the European Union has made to Dominica over the years. Head of Delegation of the European Commission to Barbados and the Eastern Caribbean, His Excellency, Valeriano Diaz also listed the many projects that are currently being financed by the European Union in Dominica. The Prime Minister expressed his gratitude to the European Union for their assistance to Dominica. “It is therefore my pleasure, through you, to convey to the officials of the European Commission and the members of the European Parliament, the gratitude of all Dominicans for many years of valued development cooperation dating way back to Lome 1,” Hon. Skerrit concluded. Meanwhile, Head of Delegation of the European Commission to Barbados and the Eastern Caribbean, His Excellency, Valeriano Diaz highlighted the extent of cooperation between the Commonwealth of Dominica and the European Union. “All of these achievements highlight the excellent level of cooperation between Dominica and the EU with emphasis on genuine development for the benefit of the people of Dominica,” Ambassador Diaz concluded.